Samsung launched its Notebook 9 Pen and Notebook 9 (2018) 2-in-1 a fortnight ago. It included details, specs and photos in its news release. Now it has followed up with a video providing a 'full feature tour' of the Notebook 9 Pen. If you are going to be in the market for a thin and light convertible with touch and pen input then this product might be worth consideration. 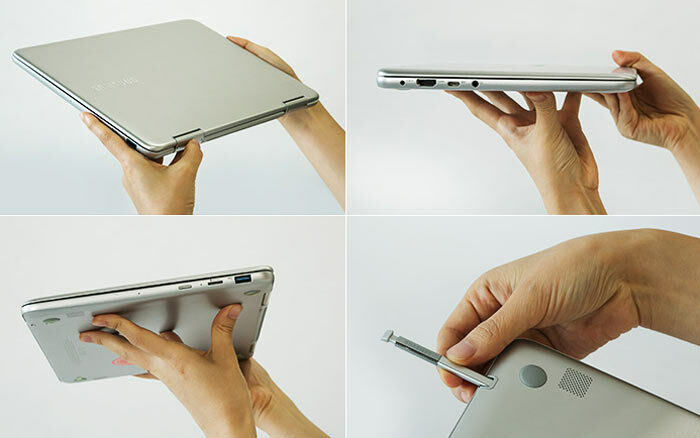 The Samsung Notebook 9 Pen is a convertible 2-in-1 by virtue of its 360 degree hinge. It works as a traditional 13-inch FullHD laptop with touch and folded back it can be handled naturally as a tablet with touch. Either mode can make use of the extra functionality afforded by Samsung's S-Pen stylus. Samsung spends quite a bit of time showing off the 13-inch 'RealView' touch display. It offers 1980 x 1080 pixels, sRGB95 per cent, △E < 2.5, wide viewing angles, and max 450nits brightness. Another important factor with the screen is its narrow bezels, and that helps Samsung make this 13-inch notebook rather compact. Performance hardware such as an 8th gen Intel Core i7 processor, Up to 16GB (DDR4 dual channel), and Up to 512GB (NVMe PCIe) storage, means this machine should be quite nippy. Construction of the notebook is said to be seamless and we are told it is a single shell body made with an ultralight magnesium-aluminium alloy dubbed 'Metal 12'. The alloy surface has a tough, durable oxide coating, says Samsung. 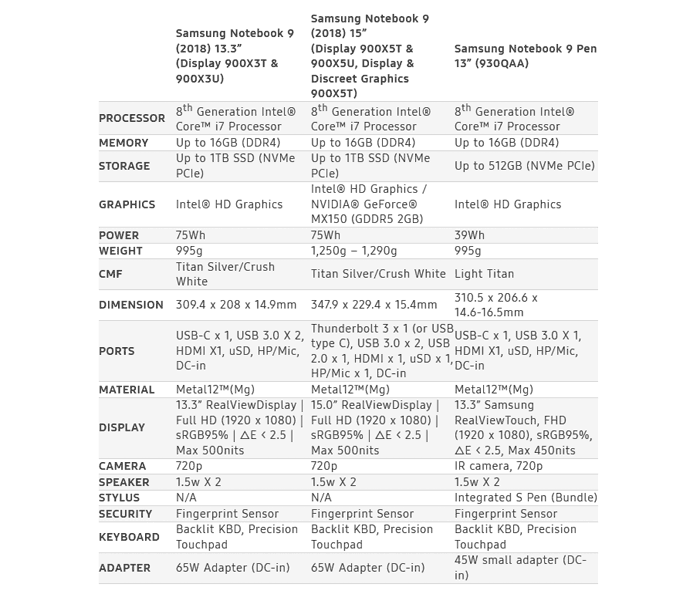 For a 13-inch convertible, Samsung's machine weighs in at an impressively light 995g (2.2lbs). The headlining quality of this particular notebook is its S-Pen. The silo-stored batteryless stylus features an accurate 0.7mm tip and is capable of recognizing up to 4,096 levels of pressure. 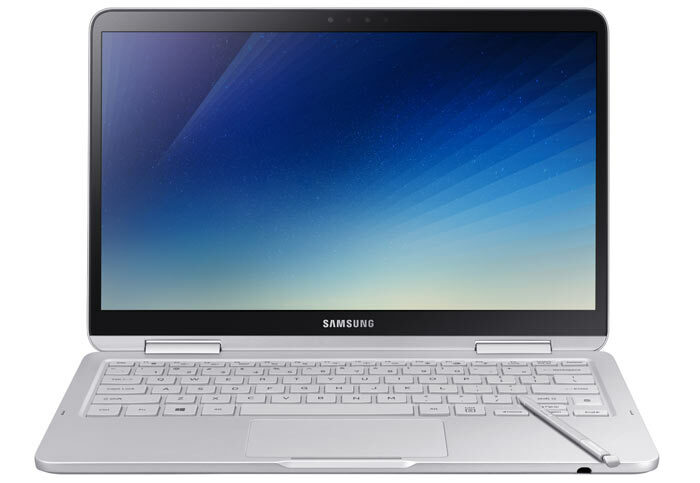 Like with its Note phablets, the Samsung Notebook 9 Pen auto-detects the S-Pen removal, launching the Air Command menu and allows for quick selection of functions like Smart Select, Screen Write, Samsung Notes, and other functions and tools. While note-taking is a good task for the stylus it works well alongside another piece of hardware, a ‘far-field’ microphone, "which utilizes advanced hardware, algorithms and noise suppression technology to isolate and record sounds even from distant sources". Other nice touches implemented in the Samsung Notebook 9 Pen include; enterprise-grade biometric security (IR face login, or fingerprint login), a Privacy Folder, secret screen functionality, smart device linking, Samsung Messages and files transfer functionality, charging via supplied charger, compatible smartphone charger or external battery packs (with fast charging support), backlit keyboard, 720p webcam, and stereo 1.5W speakers. Ports such as USB-C x 1, USB 3.0 X 1, HDMI X1, uSD, HP/Mic, DC-in are all present. 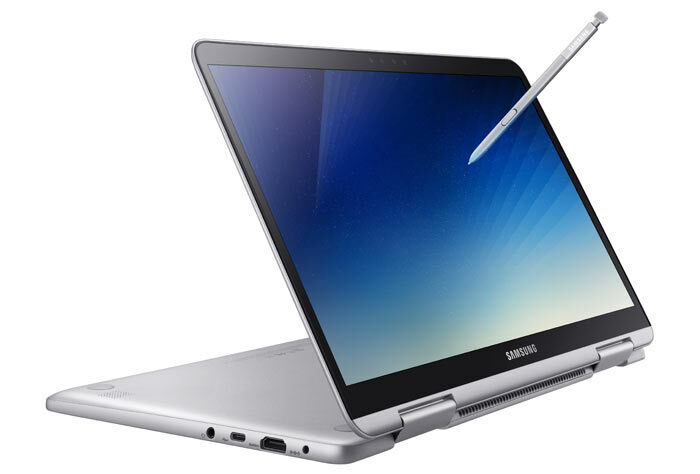 The Samsung Notebook 9 Pen is up for pre-order now in S Korea and will become available in select markets worldwide in Q1 2018.